Infiniti ads will focus on craftsmanship to justify premium pricing. DETROIT -- Nissan Motor Co.'s Infiniti brand today launched two new ads in national U.S. newspapers as the luxury marquee develops its first unified, worldwide brand image. In the past, Infiniti's team in North America, which still accounts for roughly 75 percent of the brand's global volume, would develop ads and other markets could either use them or create their own, said Jon Brancheau, global marketing director since April. “You'd end up with an inconsistent strategy and look,” he said. Not all markets will use the same ads, but going forward “the intent is to have one look and feel on a consistent basis,” he said. Rob Schwartz, chief creative officer of Infiniti's U.S. agency, TBWA/Chiat/Day in Playa del Rey, California, said the luxury brand's goal is to create a messaging platform that will stand out in the crowded advertising space and mimic great global fashion brands such as Gucci and Dior. Brancheau said he gathered his colleagues from around the world six months ago at TBWA's California office to devise a strategy. Five other TBWA offices outside the United States that handle Infiniti were represented at the meeting. The global client and agency team developed standards to build Infiniti's brand mythology to tell its story, create a sense of heritage and help justify a premium price. They settled on Infiniti's craftsmanship and breathing life into the two-year-old “Inspired Performance” ad tag by laying out the “Way of Infiniti” mythology in messaging. Infiniti's move followed beefed up U.S. advertising efforts by German competitor Audi. Unlike Audi -- one of the few auto brands that increased ad spending last year -- Infiniti dialed down. Infiniti's Kathy Roznowski, marketing director of the Americas, declined to discuss spending specifics. She did say “we've been a little dark on broadcast” in the company's fiscal year that started April 1. This quarter will be the biggest ad spend for the brand in quite a while across all mediums, she said. Infiniti's U.S. sales in 2009 plunged to 81,089 vehicles, down 28 percent in a U.S. market that fell 21 percent. Among some of Infiniti's U.S. competitors, Audi fell 6 percent, Lexus was down 17 percent, Mercedes yielded 15 percent, Lincoln dropped 23 percent and Cadillac plunged 32 percent. The first manifestation of what Brancheau called “the essence of Infiniti” can be seen today online and in full-page ads in USA Today and the Wall Street Journal. One ad compares the power of a wave, shown by a brush stroke, translated to the performance of the new G sedan. The work will roll out outside North America in the coming months. A pair of new TV commercials, one for the G sedan and G coupe, arrives Saturday on ESPN during college basketball broadcasts. In fact, Infiniti said it will tap heavily into the NCAA's college basketball tournament in March, via broad media buys on ESPN and CBS. 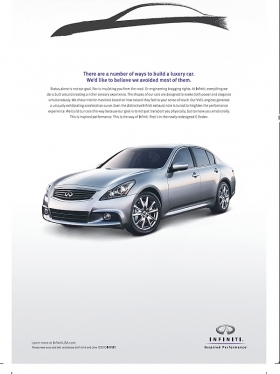 By then, the creative will shift to focus on the launch of the new 2011 Infiniti M sedan. The marketer is going for the NCAA's “massive reach” and “a lot of eyeballs” to get out its message, Roznowski said. The NCAA playoffs match Infiniti's overall target of educated, tech-savvy, 35- to 45-year-old males with annual household incomes of $110,000.